I’ve heard the same thing over and over in my life. And yet, I never had a real sister. It was always a friend telling me, promising me, dangling the possibility in front of me, teasing me, as if to say that we were real sisters. I dreamed that it could be true—that it was possible to have a bond so great; that I could finally and truly have a sister. When I was young, my teacher asked the class to write an essay about our greatest wish. It was a good start to an essay, a very passionate topic. I took to it like a starving person, so excited I was to explore the impossible. “My greatest wish,” I wrote meekly, “is for my mother to have a baby so that I could have a sister.” I continued earnestly describing the activities that we would do, the memories we would form together. I wrote that I would help raise her. That I would take care of her like my own child. I was 12 after all—a big girl. The teacher must have read my essay, because I got it back with a great big check on top, along with a ‘Good Job!’ I stumbled upon this essay recently, and the little girl that I saw on that page was just so sad to envision. She was so full of hope. Hope that would never turn into reality. My mother did give me a sibling—but a brother, not a sister, and it was way before that essay was written. My brother was all of 9 at the time, not a young child himself. I wasn’t alone. I had someone to fight with, to play with, to share a room with. I had someone to fight for my mother’s attention with, but he always won THAT battle. So I poured my heart out on that paper. I was 30 years old when I read it again, and tears formed in my eyes, so carefully had I written the words. As I got older, I did have close friends. One friend in particular stands out. We met in seminary and were inseparable. To live with someone in the same building is the closest thing to having a sibling. We were constantly in each other’s rooms, always talking, sharing, with our arms around each other, our heads bent in, so that we looked like one. Erev Shabbos, I did Miriam’s hair, and she did my makeup. “Your best feature is your eyes,” she would tell me, with her head tilted as she applied the eye shadow in just the right shade for my skin tone. We even had a dream to open up a salon together. We wanted to call it Silver and Gold, because her last name was Silver and my name is GOLDie. I would be the hair dresser and Miriam would be the makeup artist. As we navigated our years in Eretz Yisroel together, I got to know her family. Her Zaidy became my Zaidy, and her brother became mine. I knew everything about Miriam. I was there for her when she got very sick, I was there when we grabbed our notebooks and studied in the park for our tests. I woke her up at 6 am one morning, and we took off, sleepy eyed, to Netanya Beach. We had our backpacks and our love for nature and adventure as we rode on the bus, her head on my shoulder, looking out the window as the sights of Eretz Yisroel passed us by. We had so much fun at that beach. We swam in the cool water and lay in the hot sand. “Let’s take a picture,” I said. It was back in the day when you actually had to use a camera to take pictures. As we looked around, we didn’t see anyone we trusted with that precious and expensive possession. “I’ll put it on a timer,” I said. I placed the camera on my knapsack and pointed it in the right direction, facing the water. We ran, laughing, to take a pose before the timer went off. We were the artsy type, so we took one with just our backs, hands around each other, facing the ocean. The camera snapped the picture just as a wave was turning. It was a gorgeous shot. It captured our friendship perfectly. We were together, facing the world. After two years in seminary, we came back to America. She went to live with her brother in Cedarhurst, and I moved into an 8x12 room in Boro Park. Miriam had a car. She helped me move out of my mother’s apartment. We texted each other every morning and called each other after 9 pm, when it was free. We spent many Shabbosim and even the long Yamim Tovim together. She took me to my first manicure. I brought her with me to the lingerie shop and showed her the ropes. She took me to my first Broadway Show. We got stuck in the snow in Manhattan, with wet feet and no car. I still have the Nike socks that we bought to keep us warm in the crazy winter storm that left 10 inches on the ground. We shoveled our hearts out the next morning at her brother’s house. It was a lot of snow. Then we sat on the sofa, drinking our hot coffee, cozy and warm inside the house. Little did we know how our lives were about to change. We got married 3 weeks apart from each other and had our babies 4 months apart. And our lives were never the same. I got to Miriam’s wedding early. I was confused as to why I hadn’t been asked to be her shomeret, and even more taken aback when I got lost in the crowd watching her badeken. You’re like a sister, you’re like a sister…the bond we had had no place at her chasuna, where she was surrounded by her real sisters, whose hands she held as she davened, while her chosson covered her face with the veil. I wore a long gown, as is customary for siblings. I had spent a lot of money getting my hair done in a very unflattering updo, which I thought was the greatest hairstyle ever. I said hello to Miriam’s real siblings, and of course her Zaidy, who was almost mine. At her chuppa, I wanted to sit in the front with her family, but somehow, I ended up standing somewhere at the back of the room. The all-important job of handing out the Tehillim booklets fell upon another friend. I took the booklet quietly from her, not even bothering to open it up and daven. The pain in between my eyes was getting stronger and stronger. My best friend, my almost-sister, was getting married, and I was on the outside looking in. Although I was getting married a mere 3 weeks later, I still felt like I was being left behind, holding on to the best memories of my life, but holding them alone, like a bouquet of rejected flowers, wilted—not treasured like they should have been. After the chuppah, all the seminary friends took our assigned seats and chatted, as we nibbled on the challah and the pickles. I had a plastered smile on my face, while I attempted to understand what was happening. As I stuffed my face with challah, I tried not to cry. I blinked back the tears as they gathered and excused myself to the bathroom. On the way there, I passed by the chuppah room where the family was taking pictures. I quickly looked away; it was too painful to watch. I knew them all so well. I loved them all so much. But I was not a part of their family. I was not going to be in those family portraits with them. She was not my mother, and he was not my Zaidy, and she, she…was not my sister. She was only like a sister. The hardest part of the wedding—and the part where I felt like I was being kicked in my stomach—was the dancing. As per the usual, her mother danced with the kallah first. Then came her siblings. I remained holding hands with my friends. But when the family was finished dancing with Miriam, I was all ready to go and hold her hands, but she didn’t pick me. She picked another friend—the one who had been in charge of the Tehillim—the one who had been with her the whole day. The friend parallel to me…or maybe even more important. The fake smile left my face; I just couldn’t handle the shame and pain of it all. When I did get a chance to dance with Miriam, I knew then that I was worth just so many girls who went to dance with her before me. I was not second. I was not even third. I don’t even remember what number I was, because by then it didn’t matter. I didn’t matter. I didn’t count. I felt like I made up the whole friendship. Like it was in my imagination only, but in reality, I was not her most important person, as she was mine. It was like the scales got tipped, and it looked all wrong all of a sudden. Getting through that wedding was the hardest thing for me to do. I drove home in the middle of the night, sobbing so hard that all my makeup came off. When I got home, I looked at myself in the mirror in horror. Like a sister was a lie. I was living a lie. And today…today was the truth. I could never ever get over or forgive such insensitive behavior. I could never ever be like a sister to anyone ever again. From that day on, Miriam and I became strangers. It was like what we had had never happened. Yes, we became wives and mothers and life got in the way, but she always made time for her siblings and even her in-laws. I was so hurt; I couldn’t be myself with her anymore. We turned into women who seemed to have very little in common. It was the end of a story that was once so beautiful, and now had turned so muddy. Miriam lives in another state now. I haven’t seen her in many, many years. Sometimes, I think of her and get really sad about what happened. However, I have learned to treasure the memories, and I will forever be grateful for the opportunity to at least know a little of what it feels like to have a sister. Recently, I was in a tizzy, running around my house and throwing out all the items that hadn’t been used in years. There were tablecloths, clothing, toys, and arts and crafts projects. All of a sudden, I had a small painting in my hands. 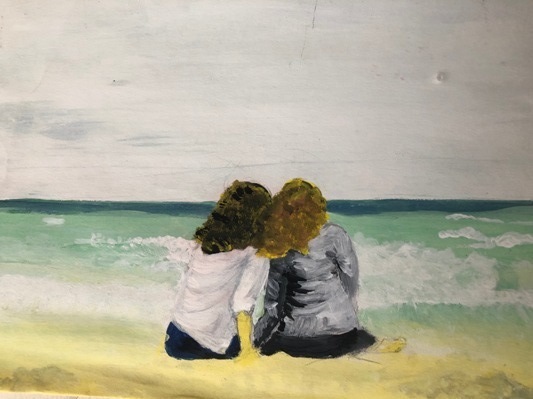 It was of two girls on the beach, with their backs to the painter, their hands around each other’s shoulders…I remembered painting this piece a few days after seminary was over and I had developed my film at the local pharmacy. It was the picture of Miriam and me that day we had woken up early to go to the beach in Netanya. It was such a beautiful painting, such a beautiful time, that I smiled and heard our careless laughter, felt the cold waves at our feet, and the warm sand on which we sat, hands around each other—captured forever in an outdated image. I put the painting back on the shelf. It will be out of sight, but always in my heart. is a teacher, author, mother, and wife. She lives in New York with her husband and 3 beautiful children.